3 Ply, 1 skein (1 oz. "Tangle-Proof" Pull-Out Skein) each of Emerald, Scarlet and White; a few yards of Yellow and Wood Brown for Clown Mittens; 1 skein each and Baby Pink; a few yards of Scarlet and White for Humpty Dumpty Mittens. 1 set each of No. 1 (2 1/2 mm. size) and No. 3 (3 mm. size). GAUGE: With No. 3 needles-7 1/2 sts make 1 inch; 9 rnds make 1 inch. Directions are given for Small Size. Changes for Medium Size are in paren­theses. For Humpty Dumpty Knitting Pattern Mitten, work with main color (Blue Jewel) only until 2 (2 1/4) inches from Base of Thumb have been completed. RIGHT MITTEN . . . Starting at cuff with Emerald and No. 1 needles, cast on 40 sts. Divide sts among 3 needles and join, being careful not to twist sts. Work in ribbing of k 2, p 2 for 2 1/4 inches, increasing on last rnd 2 (4) sts. Change to No. 3 needles, drop Emerald, attach Scarlet and work in stripe pat­tern as follows: 1st, 2nd and 3rd rnds: With Scarlet knit around. Drop Scarlet, pick up Emerald. THUMB GORE . . .
1st rnd: With Emerald k 1, place a marker, inc 1 st in next st, k 1, inc 1 st in next st, place a marker, k to end of rnd. 2nd and 3rd rnds: With Emerald knit around. Drop Emerald. Pick up Scarlet. 4th rnd: With Scarlet k 1, slip marker, inc 1 st in next st, k across to last st before next marker, inc 1 st in next st, slip marker, k to end of rnd. 5th and 6th rnds: With Scarlet knit around. Drop Scarlet, pick up Emerald and con­tinue in this manner, changing colors every 4th rnd thereafter, and increasing 1 st in first st and last st between markers on every 3rd rnd, until there are be­tween markers 11 (13) sts. Next rnd: Still working in stripe pattern, k 1, remove marker, slip next 11 (13) sts on a safety pin to be worked later for Thumb. Cast on 3 sts, remove marker and knit around, until Mitten measures from cast-on sts at base of Thumb 11/4 (11/2) inches, or when tried on, reaches to the base of fingers. Next rnd: Still working in stripe pat­tern, k the first 16 (17) sts, slip the next 10 sts on a safety pin to be worked later for Little Finger, cast on 2 sts, k to end of rnd. There are on needle 34 (36) sts. Divide these sts among 3 needles, having on first needle 17 (18) sts, on 2nd needle 8 (9) sts, on 3rd needle 9 (9) sts. Knit around until piece measures from cast-on sts at base of Thumb 2 (2 1/4 ) inches, ending with a complete stripe. Break off yarn. 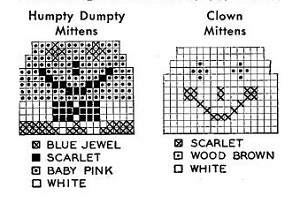 Attach White on both Clown and Humpty Dumpty Mittens. With White k 3 rnds for Humpty Dumpty; 9 rnds for Clown. For Humpty Dumpty attach Baby Pink, with Baby Pink knit for 6 more rnds. 1st rnd: With White (Baby Pink for Humpty Dumpty), on first needle, k 1, sl 1, k 1, p.s.s.o., k across to last 3 sts, k 2 tog, k 1; on 2nd needle, k 1, sl 1, k 1, p.s.s.o., k across; on 3rd needle, k across to last 3 sts, k 2 tog, k 1. 2nd rnd: Knit around. Repeat these 2 rnds until there remain 22 (24) sts; on Humpty Dumpty Mittens 14 (16) sts. On Clown Mittensonly, break off White, attach Yellow and continue to shape tip as before, until there remain 14 (16) sts. Break off yarn, leaving a 12-inch length. Weave sts together. THUMB . . . Transfer the 11 (13) sts from safety pin on 2 needles. Attach matching color yarn and, keeping con­tinuity of pattern, pick up and knit 3 sts over the 3 cast-on sts at base of Thumb. Divide sts among 3 needles and k around until Thumb measures 1 1/4 (1 1/2 ) inches, or reaches 1/2 inch from tip, ending with a complete stripe on Clown. Break off yarn, attach White (Baby Pink for Humpty Dumpty) and k 2 rnds. 1st rnd:* K 1, k 2 tog. Repeat from * around. 3rd rnd: * K 2 tog. Repeat from * around. Break off, leaving a 6-inch length of yarn. Thread this yarn through a needle and draw through remaining sts. Pull up tightly and fasten off securely on wrong side. LITTLE FINGER . . . Transfer the sts for Little Finger from safety pin on 2 needles. Attach matching color yarn and, keeping continuity of pattern, pick up and knit 2 sts over the 2 cast-on sts. LEFT MITTEN . . . Work as for Right Mitten to within Thumb Gore. THUMB GORE . . . Knit around to last 4 sts, inc 1 st in next st, k 1, inc 1 st in next st, k 1 (position of Thumb is now established). Complete as for Right Mitten. CLOWN MITTENS... Following chart, embroider Face in duplicate st on White section of Palm. Hair: Cut 2 strands of Yellow, each 2 inches long. Double these strands to form a loop. Insert crochet hook through both thicknesses on first row of Tip Shaping, draw loop through. Draw loose ends through loop and pull up tightly to form a knot. Make a fringe in each st along top of Mitten to corresponding row on other side. Trim ends evenly. Press lightly. HUMPTY DUMPTY MITTENS... Starting on last 2 rnds of Blue Jewel section of palm, embroider face in duplicate st, following chart. Press lightly.